Flanked by the provinces of Alicante and Valencia to the north and Almeria and Granada to the west, the Murcia region has been one of Spains best-kept secrets. The resort is located between the unspoilt beaches of the Costa Blanca and the authentic university city of Murcia. The resort lies secluded in a protected nature reserve. This area is perfect for cycling, horse riding, tennis, basketball, tabletennis, hiking and of course playing golf. At the Mosa Golf Resort, the eye catcher is the 27-hole Championship Course, which should be considered as one of the finest in Spain. 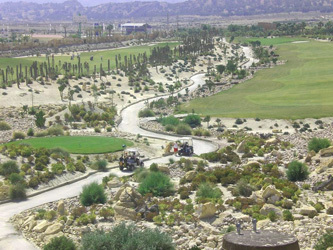 The golf course has been constructed to USGA and PGA standards and is Spains first ecological golf course. In combination with the 9 holes par 3 Challenge Course and the driving range this resort gives enough golf challenges for the more experienced and beginning golfers. In 2004 this esteemed course was selected to organise the PGA European Pro Tour Championship Final.